What does a person who sews get for his relatives for Christmas? Something he's made by hand! After seeing Handmade Nation the other day, I'm all for making things on one's own, especially if it's for something like a gift for the holidays. There's something about the act of making something by hand that adds an extra element to any gift, I think. I'm realizing that my relatives can probably buy what I'm making very cheaply from somewhere, but I'm also coming to realize that's okay. It's not the item itself that I'm giving them--even though I'm hoping they actually can use it or will cherish it as a functional object--it's the spirit of the making. I think that in our world today, and especially in our economic times, gifts of the heart that speak to fellowship and mutual caring are really invaluable. Not everyone can afford to purchase a lot of "items" for gifts, even if they are on sale with slashed prices for "Black Friday." It's not easy to pull away from the consumer mentality around the holidays, but it's possible. 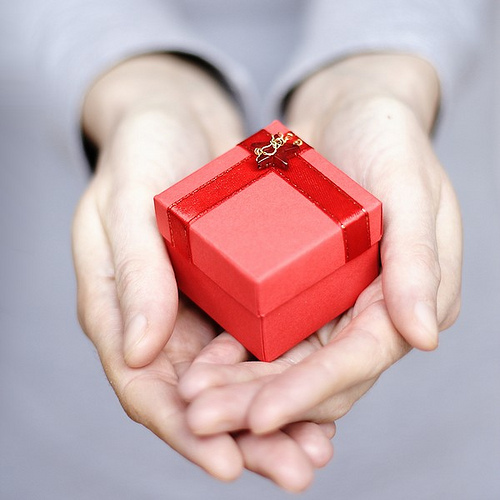 I think there's a mental shift that a person has to make nowadays that readjusts the focus of holiday gift giving to take the emphasis off the material object that's gifted and direct it toward the act of giving itself. It's easier for some than for others. Personally, I know my family doesn't care what I give them--they're just happy it's coming from me. I'm the one they care about, not the gift itself. And when you remind yourself of that, it's really freeing. And makes that mental shift a lot easier. I recall receiving gifts of homemade brownie mix in hand painted jars, of carefully crafted homemade memo books of school photos, of hand-me-down soft cover books that were well-read and thoroughly enjoyed by their original owners hoping I'd enjoy them as much as they did. In all these cases, it wasn't the item proper that was given to me as a gift, but the spirit of an experience that came with it. The taste of the brownies packaged with care, the frozen pages of memory never to be captured again, and the joy of reading that stimulates the imagination. These are things that simply can't be wrapped up and placed under a tree. These are gifts from the heart that are intangible and priceless. And it's okay to write a note that explains that. It's okay to include a handwritten card that says, "I hope you enjoy this blanket as much as I did. I used to wrap up in it when I watched TV, and it was perfect. I hope you stay as toasty warm as I did." It's time we remember the pleasure of the act of gifting, and honor the authenticity of receiving a present given in that manner. There is real dignity and generosity in giving and accepting gifts from the heart instead of Wal-Mart. This is where family heirlooms come from. This is where memories are made. I urge you to consider making something for your gifts this year. Or sharing an experience, not an item. Or providing a memory. Give from the heart not from the pocketbook. And Life Life with Relish. Image by mmolek, via Flickr. Creative Commons License. Corey, I used to enjoy making things as gifts but I've come to realise rather sadly that not everyone appreciates something handmade. "No more homemade stuff." or "Don't give me any more of your bags." really hurts. So I no longer give my bags away as gifts. Anyone who wants what I make has to pay for it. Yes, even relatives. I do make exceptions for friends who loves handmade but I make them beg me for it. And coming to the conclusion that anyone who wants your bags has to pay for them is quite logical in the face of that... I've sent stuff I've made to my family in the past, and sometimes they say something complimentary and sometimes they don't. I certainly "hit and miss" a lot. But I live so far away from them that they can put my gift away in a closet somewhere and never wear it, and still say nice things and I'd never know! LOL! And, hey, groveling is never a bad thing when it comes to friends who want your work. LOL! I've heard in some countries it can be considered legal currency! LOL! Thanks, Summer! My family grew up as lower middle class, and there were points when Christmas was just financially overwhelming for my parents... While we never felt we were lacking for anything, we knew most things were out of our price range.